Not to be confused with the band Dååth. Da'at or Daas ("Knowledge", Hebrew: דעת [ˈdaʕaθ]) is a word in the Hebrew language. 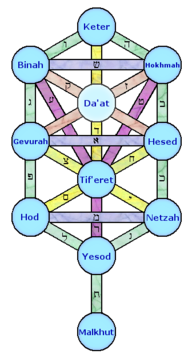 In the branch of Jewish mysticism known as Kabbalah, Da'at is the location (the mystical state) where all ten sefirot in the Tree of Life are united as one. In Da'at, all sefirot exist in their perfected state of infinite sharing. The three sefirot of the left column that would receive and conceal the Divine light, instead share and reveal it. Since all sefirot radiate infinitely self-giving Divine Light, it is no longer possible to distinguish one sefira from another; thus they are one. Da'at is not always depicted in representations of the sefirot; and could be abstractly considered an "empty slot" into which the germ of any other sefirot can be placed. Properly, the Divine Light is always shining, but not all humans can see it. The revelation or the concealment of the Divine Light shining through Da'at does not happen only in Da'at itself. It can appear by a human perspective also within the worldly affairs (Malkuth). The perception of the Divine Light shining can clearly occur also in Malkuth, all the times that humans become self-giving (Altruism). However, humans who remain selfish (Selfishness) cannot see it, and for them its benefits seem "hidden". Properly, Da'at is not a sefirah, but rather is all ten sefirot united as one. Nevertheless- Da'at is sometimes counted as a sefirah instead of Keter, from the perspective of finite creation, using Da'at to represent the "reflection of" (the "inner dimension" of) the infinity of Keter. Thus Da'at appears in the configuration of the sefirot along the middle axis, directly beneath Keter. It corresponds to the image of God. Alternate countings of the sefirot produce 10 powers ("10 and not 9, 10 and not 11" - Sefer Yetzirah) by either including Keter or Da'at. In the scheme of Moses ben Jacob Cordovero, Da'at is omitted, while in the scheme of Isaac Luria, Keter (Will) is omitted. Cordovero describes the sefirot as one light in ten vessels. Luria follows this, but lists sefirot beginning with Chokhmah (Wisdom) to describe their outer dimensions. The kochos hanefesh "spiritual state" corresponding to the sefirah of Da'at is yichud ("unification"). In the occult belief-system of Thelema, the Night of Pan is related to the progression through Da'at. The City of the Pyramids and Babalon is on the "other shore". Zer Anpin refers to the 'personification' (partzuf) of six sefirot from Khesed to Yesod - and as a whole embodies its own ten sefirot and its own Da'at. Zer Anpin personifies the revelation of the Torah and relates to the second level of the human soul called "spirit" (ruach), that corresponds to mental aspects, including reason and emotion. Accordingly, Da'at is associated in the soul with the powers of memory and concentration, powers which rely upon one's "recognition" (hakarah) of, and "sensitivity" (hergesh) to, the potential meaningfulness of those ideas generated in consciousness through the powers of Chokhmah ("wisdom") and Binah ("understanding"). Da'at operates on two levels. The higher level, referred to as Da'at Elyon ("higher knowledge") or Da'at hane'elam ("the hidden knowledge"), serves to secure the continuous bond between the two higher powers of intellect -- chokhmah and Binah, wisdom and understanding. This is Daat within Keter. The lower level, referred to as Da'at Tachton ("lower knowledge") or Da'at hamitpashet ("extending knowledge"), serves to connect the intellect as a whole with the realm of emotion; thereby enhancing one's determination and resolve to act in accordance with the essential truths that one has integrated into consciousness. This is Da'at as the third power of the intellect. Of this level of Da'at it is said (Proverbs 24:4): "And by knowledge shall the chambers be filled with all precious and pleasant riches." "The rooms" are the chambers of the heart, the emotions of the soul (as alluded to by the word cheder, "room," which is an acronym for chesed din rachamim, the three primary emotions of the soul). The inner consciousness of Da'at fills these rooms and enlivens them as does the soul to the body. In the Zohar, this level of Da'at is referred to as "the key that includes six." The "key" of Da'at opens all six chambers (attributes) of the heart and fills them with life-force. Each of these six chambers, when filled with Da'at, is referred to as a particular dei'ah ("attitude," from the root of Da'at) of the soul. Da'at corresponds with the interstitium in the human body. In the brain, Da'at is represented by the claustrum. Though their form is seemingly separate and dissimilar, their function is fairly similar. This page was last edited on 16 April 2019, at 13:34 (UTC).